Flatbread pizzas have become a stable in my house, and this version of Mediterranean Flatbread Pizza is one of my favorites. I generally use pita bread, or nann, as the base (which saves a ton of time) and since the “sauce” is really just the toppings, it only takes about 15 minutes to make. I use a mixture of olives, tomato, and chili, to give the pizza a salty, sweet, and of course spicy mix of toppings that make me think of Italy and the med. Top the flatbread with a bit of cheese and then bake off in a very hot oven and you’re good to go. I love it, and I’m sure you will too. 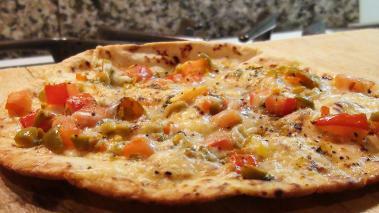 Remove from the oven and allow it to set for a minute to cool, drizzle with a bit more olive oil if desired and serve! Because this is a fairly spicy dish, with the chili pepper, I tend to avoid red wines, and the tannin typically doesn’t go well with heat. So look to a full bodied white wine like a viognier or a lightly oaked chardonnay.